This Victoria Falls tour with Devil’s Pool and Livingstone Island is made for adventure-seekers. 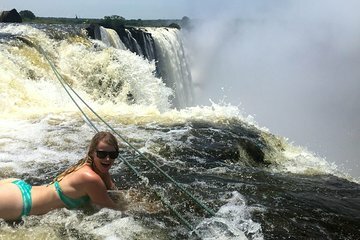 After walking along the edge of Victoria Falls on the Zambian side and exploring Livingstone Island—taking time to snap photos along the way—swim out to Devil’s Pool, an enclave at the edge of Victoria Falls. This small-group tour is capped at just eight people to ensure personalized attention from your guide. Park Entrance fees (US$20 for internationals) needs to be paid in cash. Hotel pickups and drop off's (This can be arranged for US$10 per person for a return transfer within Victoria Falls town. Please get in contact with us if you are located outside of Victoria Falls town. Price does not include visas into Zambia or back into Zimbabwe. Please ensure you have a multi-entry visa back into Zimbabwe and check that you will be eligible for a visa into Zambia at the border post. Victoria Falls world heritage site entrance.